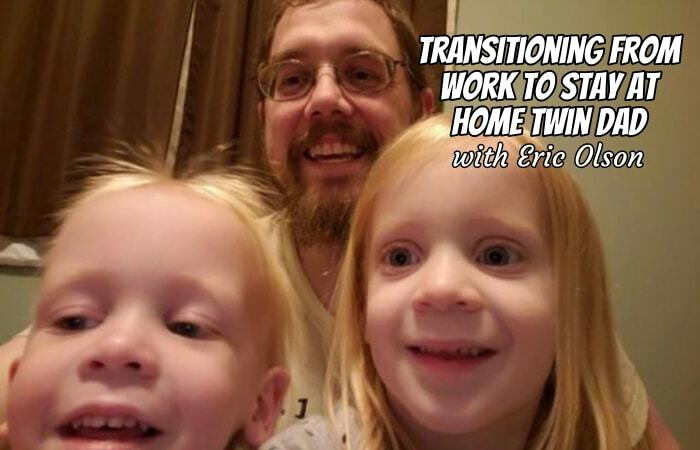 In this episode, I chat with Eric Olson, father of fraternal twin boys. 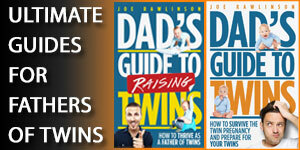 Joe: Hi there, and welcome to the 189th episode of the Dad’s Guide to Twins Podcast. This is Joe Rawlinson. 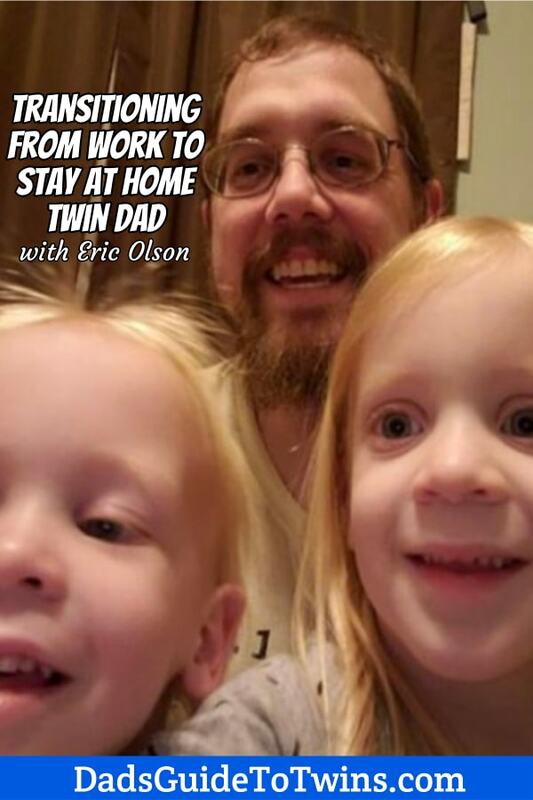 Today we are continuing our father-of-twins interview series with fellow twin dad Eric Olson. 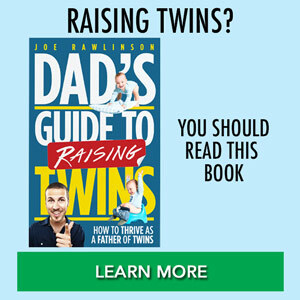 As always you can find me on the web at twindadpodcast.com, where you’ll find the complete show notes and transcript for this episode and all previous podcast episodes. 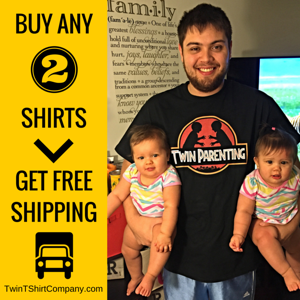 Today’s show is brought to you by my twintshirtcompany.com, where you’ll find dozens of T-shirts designed specifically for parents of twins like us. 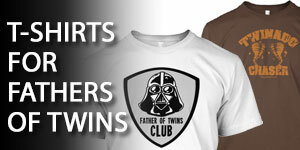 And Mother’s Day is next month so if you want to get a shirt for your favorite twin mom, head over to twintshirtcompany.com, where you’ll find shirts for mom, dad, and the twins themselves. Today in the show we’re chatting with Eric Olson, father of twins. We talk a lot about some of the issues we’re facing as fathers. About paternity leave, and the decisions to keep working, or just be a stay-at-home dad. The challenges of juggling work/life balance when you got very young children in the home. So let’s jump right into the conversation with him, as he describes the progression through the pregnancy. Eric: From week 35 on she was told not to drive and not to do much besides sit around the house. So she did end up not working for a little longer than she had planned on. But she went to the full 38 weeks. They actually had to do just a straight up C-section because the kids, the boys, showed no signs of wanting to leave. So she carried them to full term and they were rather large. The first one came out, he was 19 and a half inches, and six pounds and three ounces I believe. The OB said, “Oh, wow you’re big!” And then pulled out the other one and was like, “You’re even bigger.” Because he was just a hair over seven pounds and 20 and a half inches long. Joe: Yeah, those are good sizes for twins. Eric: Oh yeah. When people ask about that and point it out I’m like, “As far as I know, that’s pretty large for two twins, for twins in general.” Because most people I’ve talked to who’ve had twins, they come out about five or six pounds. Joe: I assume they were able to come home when mom came home from the hospital. Eric: Yeah, we were actually there mostly for the C-section follow up. The boys were fine. They never even had, they didn’t even glance at the NICU. Which, again, from what I hear is somewhat uncommon for twins. But because they were full-term, everything was working just fine. One had a small body temperature regulation issue, but just keeping him close to your chest was enough to keep him safe. They did a various little pieces, a little blood work and nothing was wrong with him. So, yeah, everybody was fine. We came home on schedule for a C-section. Joe: Was it just you and your wife working together those first couple weeks? Or did you have grandmas or anybody come over to help? Eric: For the most part it was just us, given that it was flu season. We made a decision that we wanted to kind of keep them hidden as long as possible. At least for the first couple of weeks. I’m trying to remember, I believe we had some people swing by with food a couple of times. But since my wife couldn’t drive for six weeks, and didn’t really feel up to even leaving the house for the first two or three weeks, there was really no reason for us to leave anyways. I’d go out and get coffee or get groceries. Like I said, we kind of kept ourselves kind of secluded for the first couple of weeks, just not knowing what was going to happen with the season of cold and flu and everything like that. So we just didn’t want to take a chance with that. Christmas was later that year, because they were December birthdays, so I think we did all of our Christmas stuff in January that year. Joe: Had you already lined up your daycare options before the boys were born? Eric: We had something lined up until, I believe it was, a week before they’re born. There was a provider who did say that she could take both because, while she was full right then, there was a woman there who was expecting their second child and was going to go at-home parent after the second one was born. And, I guess, she changed her mind. And so she only had one opening. And at the time we just canceled that one thinking we could find a placement for both in a single location. So we actually ended up interviewing providers, I think when the boys were three or four weeks old. We were scrambling around town in January with the boys trying to find a place for them. Joe: So were they even geographically close to each other, the two locations? Eric: Not too bad actually one was only, gosh, less than a half mile from our house. So that was a pretty easy one. And then the other one was probably another two miles away, three miles away. So it wasn’t too bad. And in terms of our commute each morning, they weren’t too far of the way either. The other nice thing is they both were willing, one definitely opened up early in the morning. I think we were dropping off by 7:00 a.m. and the other one was willing to take drop off at 7:15 in the morning. So that was the other thing, since my wife had to be at work by 7:30 I think. And I had to be in the office by 7:45 or 8:00, and I had a much longer commute through traffic. Joe: Now with regards to paternity leave, you had to kind of get creative in cobbling together some time off. And then it didn’t quite turn out as expected after you went back to work. Can you tell us a little bit about that? Eric: So a lot of places, at least places I’ve worked, you usually get topped off or filled up with your yearly allotment at the beginning of the year. So because the boys were born in the middle of December, we did have I want to say one week of parental leave that they provided us and so I was able to use that. And because I knew since May, well since March is when we started trying again after the first couple of times didn’t work. I had been saving my time off. So I had a lot of my time off kind of there. So it was enough to get me to the end of the year counting for all the holidays and everything. So that by the time the new year came around, I got another two weeks of paid time off and a week of sick time that I’d then just kind of threw on the end. Eric: The person that I ran this by and got approval from approved it, was happy about it, wished me luck. Was excited, I wouldn’t say excited, but they were very much behind it. And then she left the company probably like I think September, October and then the search for a replacement took forever. And while her manager was my interim manager, and didn’t seem to have a problem with it, when I came back it seemed like my co-workers hadn’t been too thrilled with me being gone for six-and-a-half weeks or so. And then the new manager, who had been hired like two weeks before I started, didn’t really seem to warm to me. And I kind of felt like a lot of stuff that happened afterwards that kind of led to me leaving the job altogether and finding a new job. Just kind of, I wouldn’t call it retaliation, because I don’t think it was that. Eric: I think it was just people didn’t like that I was gone for so long. And so when it came around time for the new guy to kind of do his tour of the team to figure out what people liked, people I don’t think gave the best impression of me. So he kind of walked in with kind of a negative impression of me to begin with. So, coming back, and being sleep-deprived and having kind of very tight hours in terms of I had to leave by a certain point most days to pick up the kids. I couldn’t come in much earlier than I was coming in. All of this kind of led to, I think, a lot of feelings of ill will and a sudden like what I felt like was a 180 on people’s opinion of my work there. So it kind of became a stressful situation and I used that time to leave. Joe: Yeah, but you do bring up some good points like you need to have supportive management if you’re going to take leave. And then if there’s not a culture of supporting that within the company, I mean you’re kind of the anomaly. Right. And everyone’s like, “Well, how come this dad gets to take time off and we’re still working?” Which, even though you use the time that you had been allotted, which is what it’s for. You mentioned, when you came back to work, you’re kind of not performing at the optimum level because you’re so sleep-deprived. I know I remember that going back to work. And I couldn’t think clearly, it took longer to make decisions. It took longer to do stuff. And then, like you mentioned, you’ve got the family obligations in the morning before work and right after work. The manner in which you’re working kind of shifts over night with perspective of your coworkers. I know that took some challenge for me to manage my manager and manage my coworker’s expectations. Joe: Yeah, right. That’s like totally normal right? Eric: Why would I ever even consider doing that? I don’t know who these people are. I don’t know how they’ve been vetted. And it’s curious only because I know one of Best Buy around here just cut ties with an emergency care provider because questions had come up about the vetting of the people that they would send over. Joe: Yeah, so were you able to find a more, I don’t know, family-friendly or father-friendly work environment after you moved out of that job? Eric: In terms of the flexibility. And it’s closer to home for one thing, that was helpful. They were more flexible in terms of their work hours. Even though I was now coming in at 8:15 in the morning I was still one of the first people to walk in the door. Which did sometimes make it feel weird when I was walking out at 4:30, 5:00 in the afternoon sometimes and everybody was still there. It felt like I was ducking out early even though, you know, I had worked in the morning and I had been working on the weekend. Things like that. It was just like leaving the office sometimes felt weird. But it was a very, much more flexible environment. Accommodating to me in terms of what they were fine with. “Oh, you’re going to work some extra time in the morning? You’re going to be up at 6:00 a.m. to do some work so you can leave at 4:00? Sure, no big deal.” You know, as long as I was making my meetings and getting my work done it was fine. Eric: And actually when I gave them my notice after Thanksgiving this year that, given everything that had gone on with me in the past few months and everything else, you know I felt it was necessary to take a step away from working and become a stay-at-home dad for awhile. I kind of expected, especially from certain people, not necessarily pushback but kind of like, “Why would you do that?” And it was extremely supportive. The only kind of pushback I got was, “Well, hey, if you’re looking for work, if you want to do some work from home let us know in a few months. We might be able to find something for you.” It was a very like 180 in terms of the previous company and my current one, which made leaving a little harder. But, again, working 50-plus hours a week and only seeing my kids on nights and weekends was getting to me. Joe: That is tough. How long did it take you to come to the decision with you and your wife for you to become a stay-at-home dad? Eric: My wife has always loved her job. Whereas I have always just the job is what I do. It might be what I’m good at, but it’s just what I do to make income. To feed my lifestyle, support my family, whatever. And so about a year ago I was starting to feel a little burned out just from a lot of projects at work and trying to keep up with the kids at home. And I think part of it was with them hitting their twos at the time, it was just getting harder and harder to feel like interaction with them in the evening and on the weekend was positive. When they were six months old, a year old, or even a year-and-a-half you didn’t have a lot of the other baggage that comes along with older kids. You didn’t have the discipline issues. You didn’t have the contrariness. You didn’t have the threenager, the terrible twos or anything. It was just you had a child or children who was happy to see you. They wanted to be around you. And so, yeah, you didn’t want to step away from that, but it wasn’t like you had negative interactions with them for that short period of time every night. Eric: And then they started getting to be two-and-a-half years old of so and suddenly every night was a battle. It was all negative interactions with them because we’d come home from work, we were tired. They had a full day at daycare playing and running around and they weren’t exactly awake themselves anymore either. They’d get home, they want dinner right away. We can’t really do much in the evening because they need to go to bed by 7:00 at night so they can be up at 6:00 the next morning to get ready for daycare. It just felt like every interaction with them was a negative interaction. So about a year ago I was feeling like, “I don’t really like the way this is all going. I feel like I’m devoting too much time to my career and to working. And, oh, I’m spending 65%-plus of my paycheck expressly to work.” It’s going right back out to someone else to support my career. Whether it’s daycare or parking or extra commuting. Keeping the car maintained, filled up with gas. Like I said, the parking and everything else that went along with it. It became harder and harder to justify spending that much money for seeing my kids that little. Eric: So I started to talk to my wife about it. We were able to do some stuff financially, refinance the house. A couple of other things that kind of cut back on our monthly outgoing expenses. And we realized well, actually, we could theoretically live on just her salary alone. So started kind of looking at it more and more. Figuring out things I could do to maybe supplement my income over time. I have cystic fibrosis and so last August I got sick from a cold and it just never went away. And I ended up on a nine-week-long course of IV antibiotics. And I was just toast by that. It was just distressive trying to keep up with that and the sleep schedule that gets messed up for the dosing that goes along with that. Trying to explain to the kids why I have these tubes sticking out of my arms. It just began to be too much. So after a little more chatting I decided in I think like October that I was going to let my work know about a month ahead of time that I was done. Just before the office semi-closed for the holiday. Joe: So, now that you’re home full-time with the kiddos, what’s a typical day-in-the-life taking care of them during the day? Eric: So it first started off we spent most of our time in the house, between it being extremely cold or literal snowbanks that would bury them. I wasn’t able to really get out of the house much with them for the first four-to-six weeks. So we spent most of the day, we’d get up, do our breakfast routine. Do a lot of playtime, mostly imaginative play or some crafts, things like that. And then we’d watch some TV for lunch, then we’d have our nap time. And then, by that point, my wife would usually be home by the time nap time was over. And then we’d just do whatever we could do, whether it was shopping with them or anything like that. And then, now that the weather is clearing up, it’s more about getting out of the house doing things. Eric: We’re kind of in that weird, quasi-“Is it Spring yet? No, not really” time of year in Minnesota. So it looks, it might even be, warm outside but nothings really open or ready to do any kind of the Spring or Summer activities yet. So I foresee that, once more of that opens up and we actually transition out of that kind of frozen icebox status, we’ll do more things. They were really up on fishing last year when we went and did it at my parent’s place and did it out on various lakes. So we’ve got a few lakes nearby and a few parks nearby that I’ll probably be taking them to more frequently to go fishing. And we’ll play on the play structures. One thing I haven’t been really good about doing is getting them out to anything that’s structured or even just getting together with other adults. It’s been kind of my issue. I don’t think I’ve really been missing adult interaction, per se, in that respect. But I feel like they need some more interaction with kids. And we seem to go to the playground at odd times around here that there’s never anybody around even when the neighborhood’s full of kids. 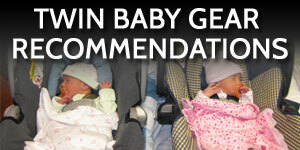 Joe: Has their sleep schedule adjusted now that they don’t have to get up for daycare in the morning? Eric: Not as much as I would hope. Usually by about 6:30, 6:45 one or both of them is saying, “I want to get up.” And so I’m still getting up at 6:00 in the morning so I can get all of my stuff done before they’re awake. And the only problem is that their sleep time or their bedtime has gotten later even though their waking-up time has not. And I think one of the culprits there is that nap time is starting at about 2:00 when maybe it should start about 1:00. Which I’ve been trying to push back, but they push back themselves. Joe: Are they in big beds now? Eric: One of them was crawling out of his crib at 14 or 16 months. Since they’re in the same room and he was climbing already, and he showed us he was climbing by climbing into a crib, we figured it wasn’t safe to have one of them in a crib and one of them in a toddler bed. Because we just had visions of him climbing into his brother’s bed and landing right on top of his brother. We ended up taking the sides off both and turning them into toddler beds. Which they’re still in right now. We’ve actually just been doing some measurements to see about getting twin-size beds for them going forward. Joe: Yeah. Were there challenges in moving from cribs to beds? Eric: The first night we have pictures of them having fallen asleep in a pile on one of their beds. So one of them brought all their stuffed animals and blankets over to the other one’s bed and they kind of cuddled up together. We have never caught them sleeping in the same bed since, that was like a one-night thing. They’ve gotten better about it. One of the reasons why the night-time interactions had been so difficult for awhile was they did not want to go to bed that early. But knowing that they had to get up as early as they did we kind of had to force the issue. So we had a lot of work trying to keep them in. And, even now today, although we probably could get away with not doing it anymore. We still have a child safety lock on the inside of their door so they can’t open it up and get out. So it’s kind of right now unfortunately they’re still kind of trapped in their room in the morning. But we just, neither one of us kind of felt 100% comfortable yet letting them have the run of the house in the morning without us. So we’re trying to figure out strategies for that yet, including maybe just gating off the hallway so they can only get to our bedroom and the bathroom as well as their own. Joe: Yeah, that’s definitely a progression of trusting them on their own when you’re still asleep. Because they, as you’ve seen, they can get into mischief of all kinds and shapes. And they like to help each other get into mischief that one of them cannot do by themselves. Eric: That is one that they are very good at doing. While they aren’t identical in any way, shape, or form they do sometimes like to converge on the same plan and will assist each other in executing whatever it might be. Usually nothing good. Joe: So now that you’re about three or four months into this journey as a stay-at-home dad, are some of the plans that you made with your wife, are they still holding? Like your finances and the schedule and things like that? Eric: Financially we’re still working on that. I’ve been trying to find more and more time to do some hobbies that I like to do that, theoretically, could bring in some income. Some woodworking and things like that. So if I can find more and more time or feel comfortable getting more and more time doing that I might be able to do more financially with that. We’re still financially fine in many respects. One thing I wouldn’t suggest is trying to make this transition over the holiday season because it’s really hard to get a baseline. There’s a lot of extra spending and a lot of extra things that are going on that you wouldn’t normally do. So only now, after about three months, do we have a better idea of how much we actually, truly need to spend in a given month. So there’s been that. As far as our schedules, we’ve figured out the schedules what we haven’t figured out is how we make sure we have the energy to actually do the stuff around the house that needs to get done. Eric: We both, even before kids, had a tendency of letting things go a little too long. One thing we have noticed is that you can still do that after you have kids, the problem of course is that trying to then get the energy to actually take care of it now is a lot harder. So things get even further along before we actually get around to taking care of it. We did get in the habit at least of running the dishwasher almost nightly because of breastfeeding and bottles and everything when they were young. So that’s not a big deal, but a lot of the other like day-to-day stuff. I haven’t really figured out a great way to take care of that, yet. And the boys want to help, but their version of help is kind of the opposite of it. So it’s not really something we’ve been able to really do easily with them around yet. Joe: That’s the challenge we’ve had, too. I mean our kids are a little bit older now but even when they were young, like your boys, they’re so eager to help and it takes patience as a parent to find things that they can do that would actually be helpful or at least get them in the habit of helping. So that, as they get older and more able to do things that are effective, that they’re still in the habit of helping and know what a chore is and can help around the house a little bit more. Eric: Yeah, the one thing we’ve been trying to do more around here, I’ve been trying to do more because it’s just better, is cooking. And I enjoy cooking. But getting them involved in it, too. Which, when they’re three years old, there’s only so many things they can do. But yeah it easily triples the amount of time it takes to do something simple like make a salad or something, to have them involved. But you feel compelled to let them help because, otherwise, how are they going to learn? They want to help as opposed to maybe when they’re five or six and now it’s like pulling teeth to try to get them to come and help you set the table or something. Eric: And that’s kind of how I was as a kid myself. So I already know that’s very distinctly a possibility. It got to the point my parents just threw their hands up. It’s like, “All right, your room can be the way it is and that’s fine, but you’re on your own doing laundry.” So at least I started picking that up when I was like 11 or 12. Joe: Yeah, that is one skill that we’re grateful that we’ve got our kids on is they can do their own laundry. So that helps alleviate some of the burden, for sure. So how have you been able to maintain and strengthen your marriage over this twin journey. From like the pregnancy ’til now? Because twins are a handful. How do you manage that relationship with your spouse, too? Eric: I think that’s been one of the areas of difficulty for us. We have kind of settled into, sometimes we refer to it as, sometimes it feels like we’re just roommates raising kids together. With the pregnancy and then the after-effects of the pregnancy and then the sheer exhaustion of the first kind of year-and-a-half we kind of fell out of the habit of a lot of the things that couples do to kind of maintain things. So we still go out of our way to say I love you, to acknowledge when somebody does something for us and things like that. But a lot of the intimacy has been kind of something that we’ve had to slowly build back up. Things like chores, things like communication those are the big things that we’re kind of working on right now. Because I think a stress point for both of us is just having a functioning household sometimes. Eric: And so, also with the change to me being a stay-at-home dad, is figuring out that role too. What it means for her when she comes home from work, how she interacts with the kids. Because now, instead of both of us being in the dark about how their day was, I’m intimately aware of how their day has been, she’s still in the dark. And so there’s always tension, not always tension, but there’s always like that line of trying to make sure she stays involved. I think we’re really trying to focus on making sure that we stay involved as parents first. And then we’re working at a relationship through that lens. Making sure we’re each trying to be the best parent we can and support each other that way. Joe: The struggle is very real. And especially with, as we know, having twins. It’s like all of your focus seems to be on keeping these kids alive and getting through the motions of what they need to do every day. And it’s really hard to carve out time to be with your wife, with your partner. And we had to be really conscious about that. You know, making sure we were having time on the calendar. Even if we had to schedule something like, “Okay, we are going to have a date night on this date. We’re going to make it happen no matter what happens.” To make sure that we stayed connected. And, as the kids get older and more self-sufficient, you start to get a little bit of a release on those burdens and you’re able to find more time to be with your spouse. So there is a light at the end of the tunnel. Eric: Yeah, I think one of the things that would help us, and it’s been a problem the entire time, and neither one of us like to ask for help and neither one of us like to ask for help from our family. And so we’ve tried to do a lot of things ourselves. When I went to the Dad 2.0 Summit, six weeks ago now, that was literally the first time I was away from the kids overnight besides a brief time where we stayed in a hotel because my parent’s house was full for Christmas. So my wife and I stayed in a hotel that night. So we put the boys to bed, we went to the hotel, slept there for the night, and then came back. And we were probably there within 15 to 30 minutes of them waking up. So me going to San Antonio was the first time I had been truly away from the kids for their entire lifetime. And that’s the kind of thing that we’re not good at is asking others to take the kids. To take them on a special day, watch them for a date night. We haven’t really established even like people around the neighborhood that we might trust to do babysitting. So these are all things that it’s like, we have to even just build the infrastructure to be able to have that date night. Eric: Which I think is the biggest issue for us is it’s like, it goes back to that whole having the energy to set all this up. We’re like, “Oh, it’d be great to do a date night because this movie is coming out that we both want to see.” And then we’re like, “Oh, but then we have to figure out who’s going to watch them. Is it going to be my parents, your parents? Oh, they’re all busy? Okay, who do we have now? Well we don’t have any people.” So it’s been kind of one of the issues on our part is, because we spent the first two-and-a-half years not asking people to help out except in dire situations, it’s felt kind of weird to just say, “Hey, we want to go have some fun, can you watch our kids?” Because usually it’s been, “Yeah, our daycare is closed unexpectedly because she has the flu.” Or, “The kid has to stay home because he has a fever.” Those were usually why we reached out to people to have them come watch the kids. Joe: One of the things that we did, when they were younger, was we’d get them ready for bed, get them down to bed and then we would have somebody come over to sit at the house while the kids were asleep. And then we could go out to a late dinner or go catch a movie or something. And it was at least, you know a couple hours away was actually pretty nice compared to nothing away. And over time, you know, we started to find people that we could trust with the kids. And I’m kind of like you’re describing where whenever I’m like, “Okay, we’re going to go do something.” My first question is, “Well, who’s going to watch the kids.” And my wife’s question is like, “Well, when are we going to do it? We’ve just got to put something on the calendar and then we’ll figure out who’s going to watch the kids.” It’s like round and round we go. So Eric, as we wrap up today, if listener’s want to connect with you what’s the best way to reach out and get in touch? Eric: So for my writings, things I write about parenting or about cooking in the kitchen or kind of some other random things, my website is themodernfather.com. If you want to follow me on Twitter, my site-specific one is @BeAModernFather, that’s also the same for Instagram. So those are the best ways to really follow what I do. I have links to my podcast that I do with a close friend. We talk about parenting, geek stuff. We try to release every other Friday. We talk about parenting and then kind of go off on tangents, we call it Tangential Parenting. And all those links are available on themodernfather.com. Joe: Excellent. I’ll link up to all those in the show notes so listeners can connect with you. Eric thank you so much for sharing your story with us, we really appreciate it. Joe: So I hope you enjoyed that episode with Eric. If you’d like to learn more about Eric or connect with him, you know listen to his podcast or read his blog, you can find all the links that he mentioned there at the end over at the show notes for this episode at twindadpodcast.com. 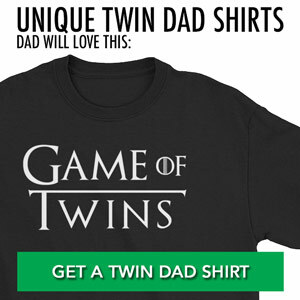 Once again today’s show is brought to you by twintshirtcompany.com where you’ll find dozens of T-shirts designed specifically for you my fellow twin dads, twin moms, and the twins themselves. And that’s twintshirtcompany.com. Hey, if you’re enjoying these episodes talking to dads why don’t you let me know? 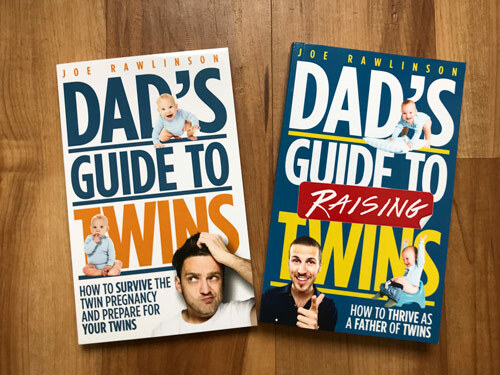 Send me a message, a DM, over on Instagram @twindadjoe, I’m also on Twitter @twindadjoe and I’d love to hear from you. I may even want to feature you on an upcoming episode of the show. Let me know if you’re interested. Thank you so much and I’ll see you next time.